1 Night, 3 Chefs, 7 Courses, 8 Michelin Stars! In May, Caprice, is hosting a seven-course dinner, prepared by three talented chefs from three restaurants, for a combined eight Michelin stars. Christian Le Squer (Four Seasons Hotel Georges V, Paris), Fabrice Vulin (Caprice), and Chan Yan Tak (Lung King Heen) have been working on the menu together for months, and each will present diners with multiple courses designed to take them on a seamless culinary journey of French and Cantonese cuisine. I was invited to a media preview to taste dishes to be served by the two Hong Kong based chefs, which was enough for me to recommend trying to secure a table as soon as possible. Originally this dinner was a one-off, but the dinner on 25 May sold out so quickly that a second dinner is taking place on the 26th. Click on the images for bigger versions. A stunning dish that left me wanting more, much more. The caviar was exquisite and the oyster had enough body and depth of flavour that it was not upstaged by its showy companion. 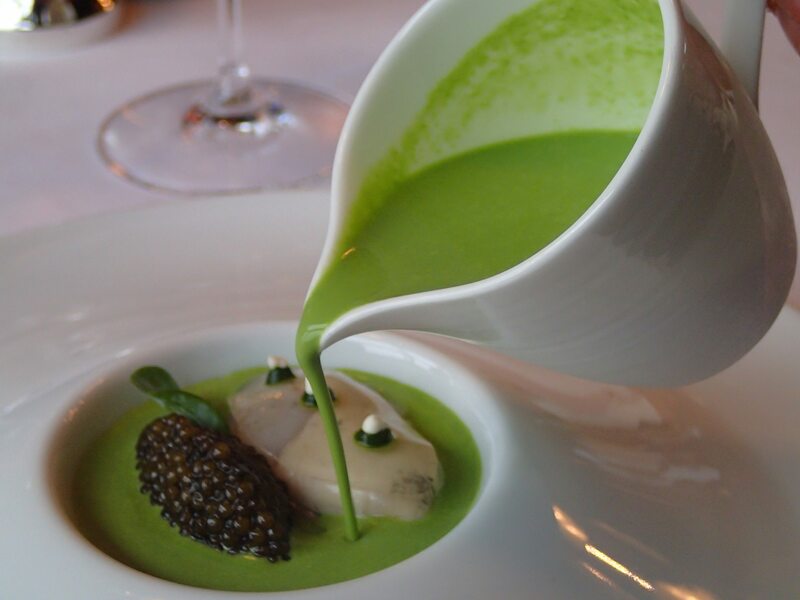 The veloute brought a spring brightness to the dish that tied it all together. A dish from chef Tak. 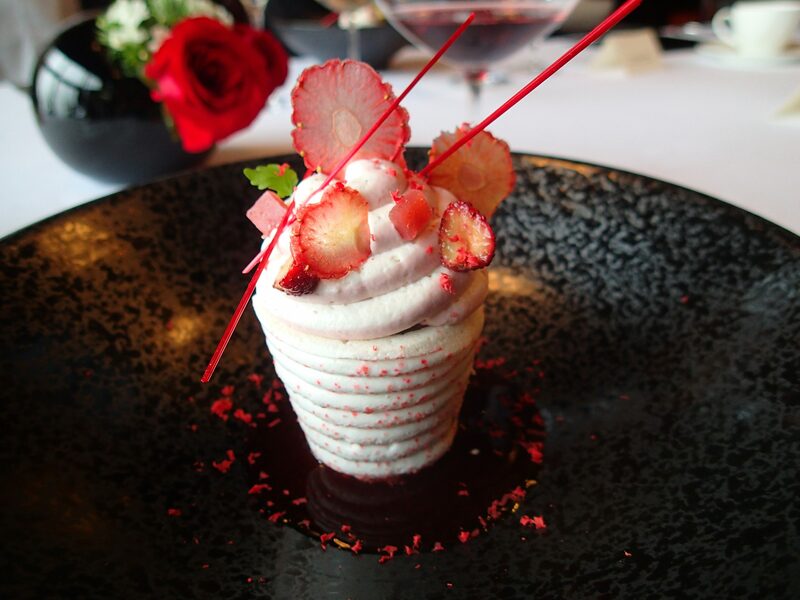 Interestingly the menu creation began with Tak coming up with his dishes and then the two French chefs created dishes which they felt combined into a harmonious menu. The crab salad (crab, truffle, mushrooms, bamboo) was delicious, although the somewhat mealy tomato it was served in was disappointing — perhaps it was meant as a serving vessel only. 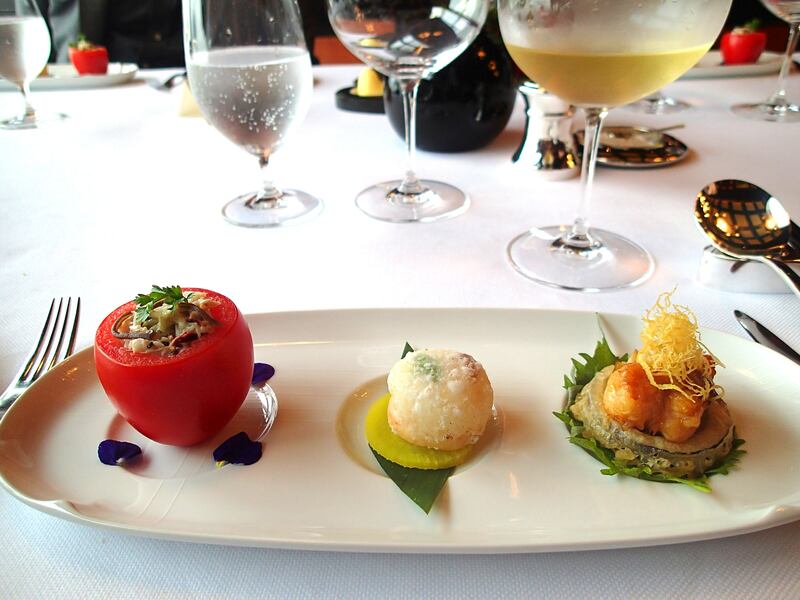 The divine deep-fried scallop with pear is a signature dim sum item and it deserves high praise. Every time I have eaten this it has been excellent. The spiny lobster served with eggplant was another success, the two key ingredients a perfect pairing. 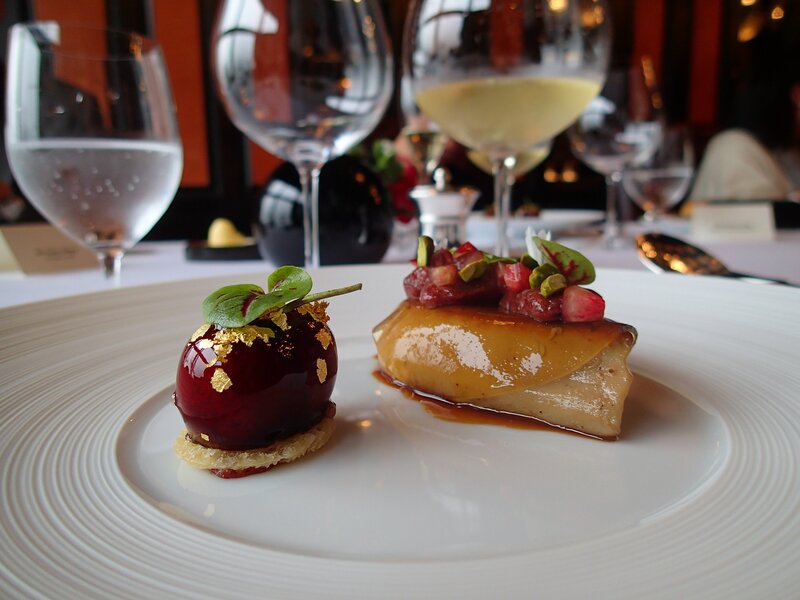 I rarely order foie gras anymore, but this fabulous dish from chef Vulin is my new benchmark. 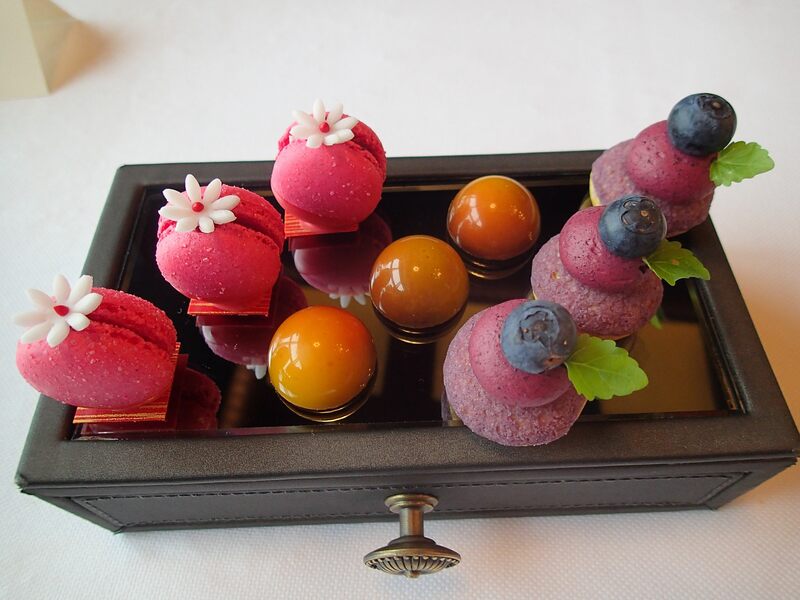 The sublime balance between richness and fruit translated into a memorable gourmet moment of heaven. The foie gras (sous vide and pan fried) was so light, it tasted clean in a way that fatty foods rarely do. 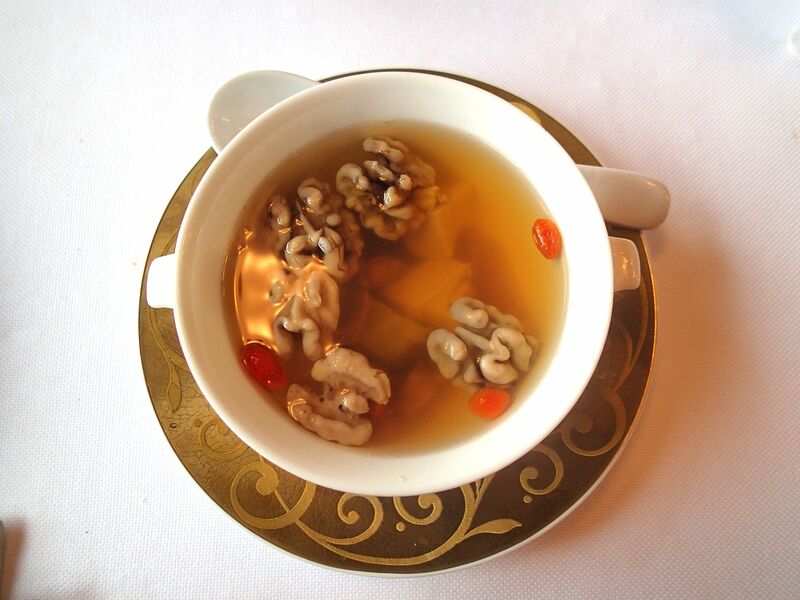 An outstanding double boiled soup, this classic Cantonese dish was the most popular on the day. The almonds, so plump and soft from the cooking process, that they almost melted in the mouth. 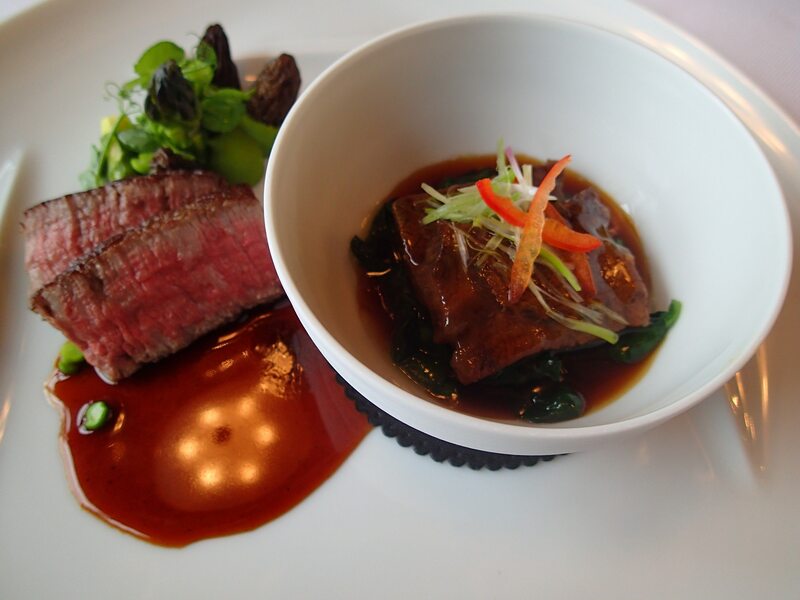 Our meal finished with a duo of beef, a dish that presented wagyu beef two ways, one from each chef, however this dish is not part of the 8-star menu. 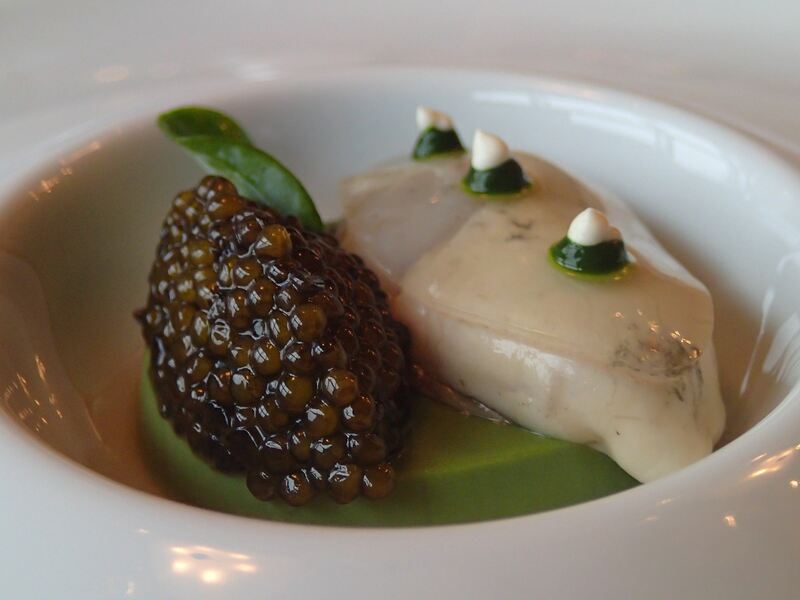 On the night chef Le Squer will present two main courses, including Line caught sea bass, Kristal caviar, and buttermilk, followed by a beef dish. Dessert is also to be confirmed so our dessert, centered on champagne and strawberries, is just an example of the creativity of the pastry team. The sauce served with the beef tenderloin was so glossy you can see the reflection of the chandelier above!